One of the strongest trends in bathroom remodeling in the past decade has been to get away from bathrooms divided up into smaller spaces. 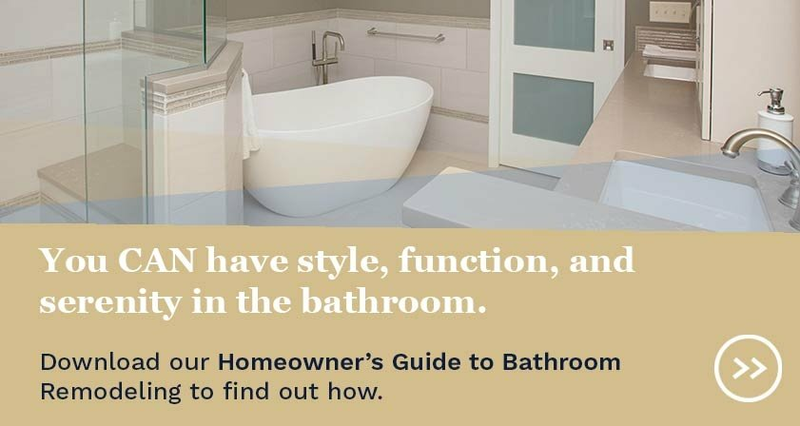 While that type of layout stemmed from a desire to include privacy in bathrooms with multiple users, such as a his and her master, the reality is that the space can offer more when it's treated as one large room. 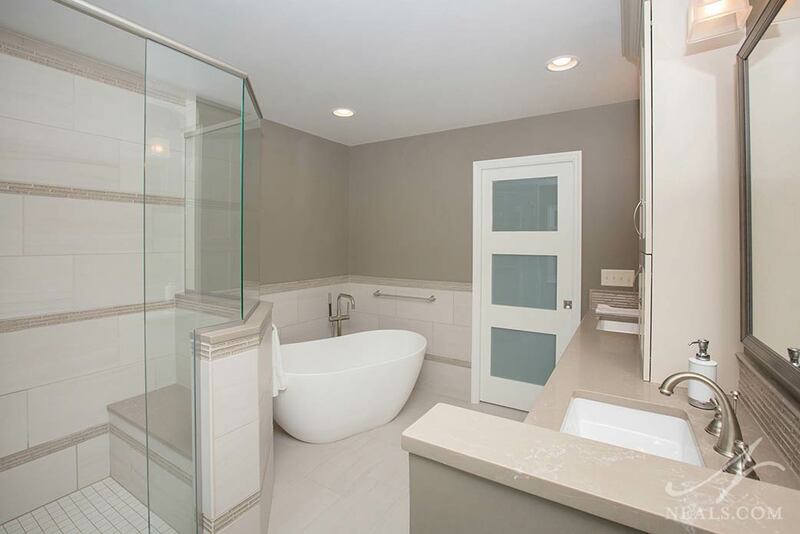 In this master bathroom, pulling the small room at the end into the rest of the space allowed not only for a stylish tub but also a less claustrophobic shower. The vanity also benefited from the increased space, and now includes a makeup vanity. 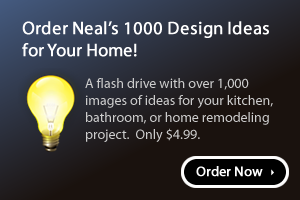 This project is a great place to look when you're wondering just what can be accomplished with the removal of a wall or two. Click here to see more images from this Indian Hill project. 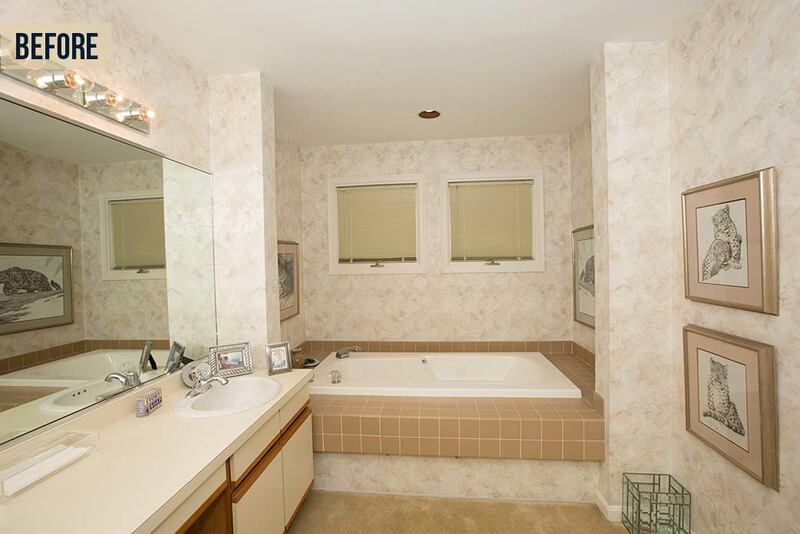 In addition to having a similar issue as the previous bathroom, this master bath was flat out boring. With no style to speak of, a dated style of vanity, and wasted pockets of space all over, the bathroom was far less than relaxing. The new bathroom (seen below from the other direction), is a reserved contemporary space that is both stylish and comfortable. The curvy, modern soaking tub tames the angles and straight lines of a well-curated selection of neutral tiles and an expanded shower. 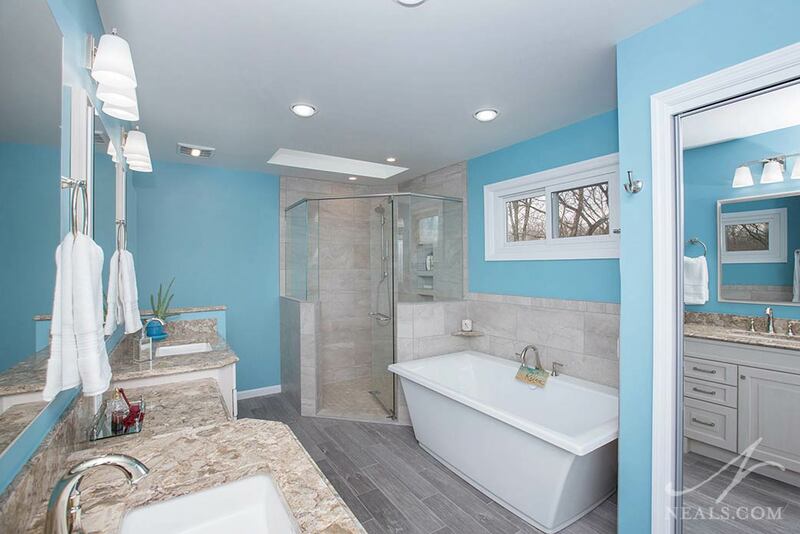 Even with the subdued color palette, this remodeled bathroom has a spa-like level of comfort and style. Click here to see more photos from this Loveland remodel. 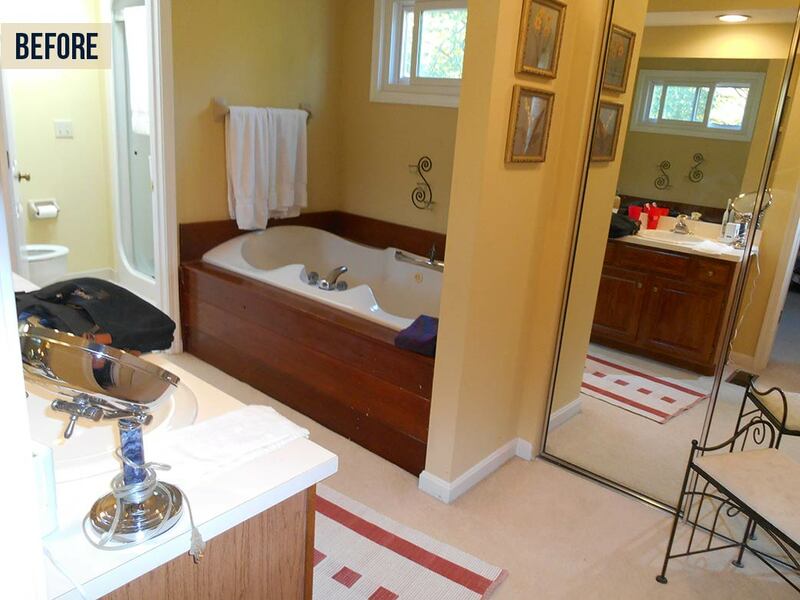 Quite the doozy, with 80's style wallpaper, tired-looking cabinetry, and carpeting, the only thing this bathroom had going for it was that the layout worked. To update and upgrade this bathroom, a bold and modern herringbone tile set the stage (it's used in the shower as well.) Removing the deck and columns surrounding the old tub provided ample space for a new clean-lined tub, creating a stylish vignette. The new vanity uses a soft brown-gray cabinet finish which helps the bathroom feel less stark and cold, which can happen when modern design isn't tempered with warm touches. 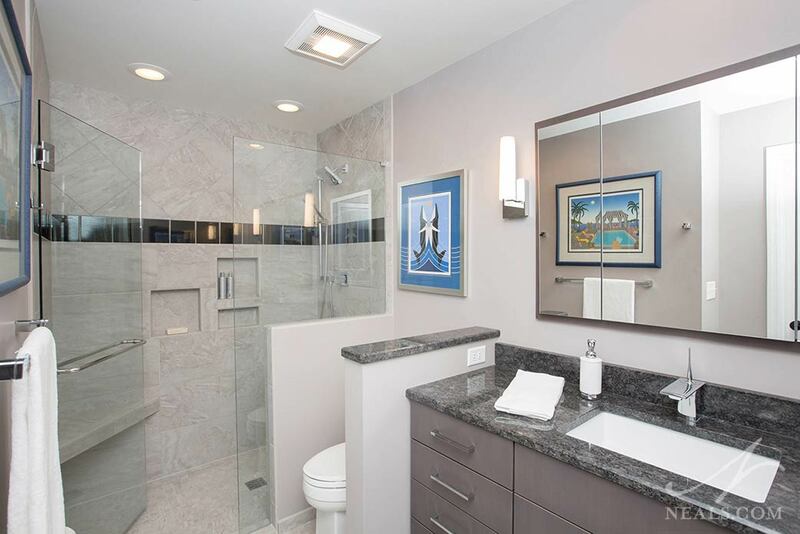 To cap this contemporary bathroom off, the vanity mirrors feature integrated lighting for a cool and futuristic vibe. Click here to see more photos from this Evendale project. It may be surprising to see the hidden potential that exists behind a typical standard bathroom. In the original bath, a tub and commode on one end and a vanity on the other created a typical boxy space with very little interest. 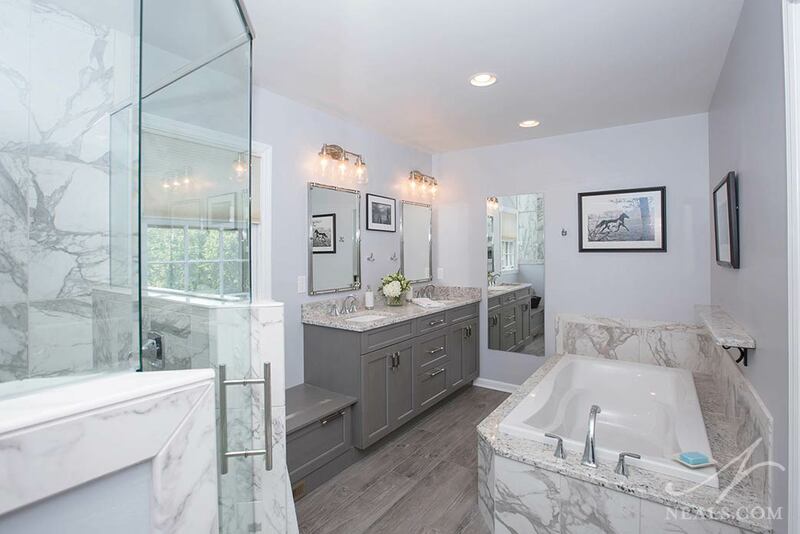 By turning the layout of the bathroom 90 degrees, and pushing 42" into the over-sized laundry room on the other side, enough space was found to be able to include both a tub and a shower, and still keep the double vanity. Of course it didn't stop with just gaining more space. A combination of marble-effect tile and granite make a stunning pair that allows for a mixture of gray shades throughout the rest of the space, creating a cohesive design with plenty of visual contrast. Click here to see more photos from this Anderson Township remodel. 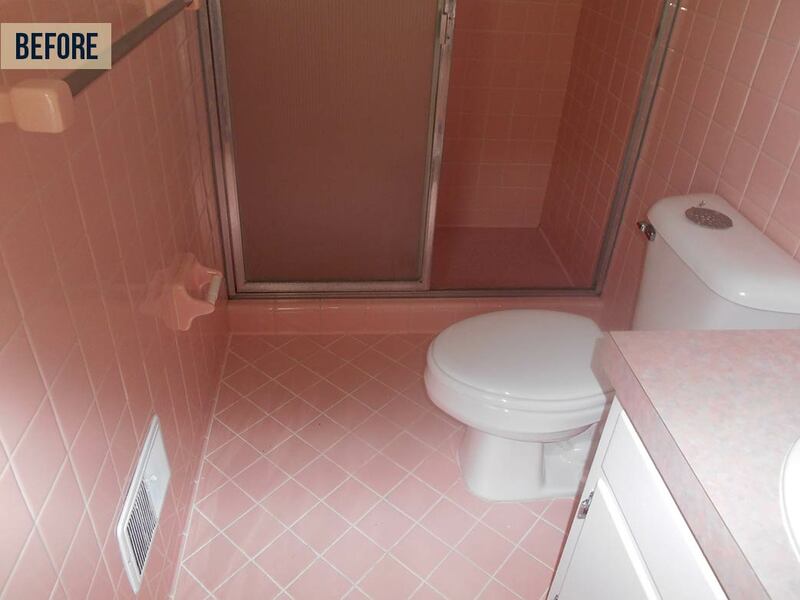 Nothing against pink, but the existing bathroom here was a prime example of what happens when your bathroom doesn't have enough contrast. 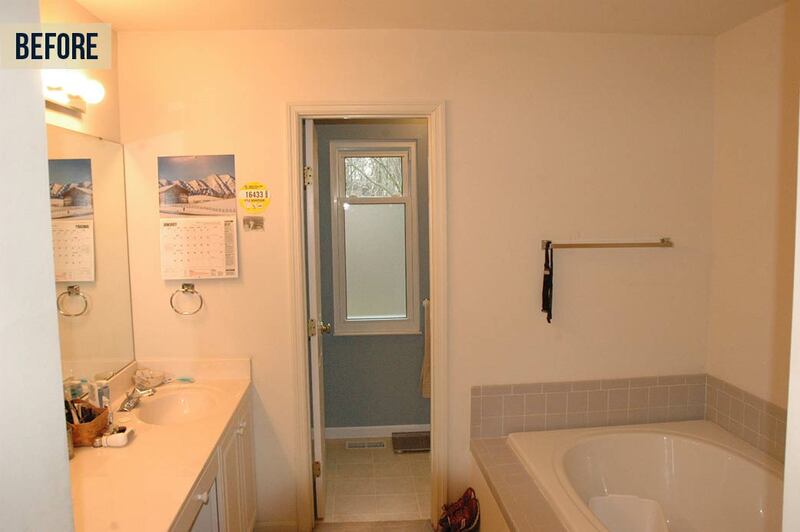 One thing that is important for universal design and aging-in-place is that bathrooms are safer when you're able to easily distinguish the floor from the walls from the countertop. 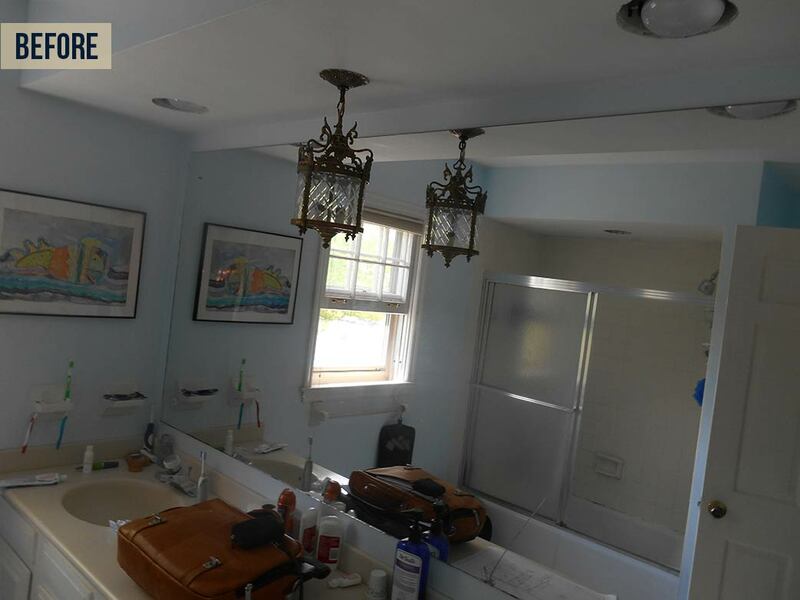 By nixing the pink and replacing it with a few different finishes and materials, the new bathroom is brighter and each individual feature stands out on its own. A bit of extra space helped here too, with the removal of an adjacent closet. 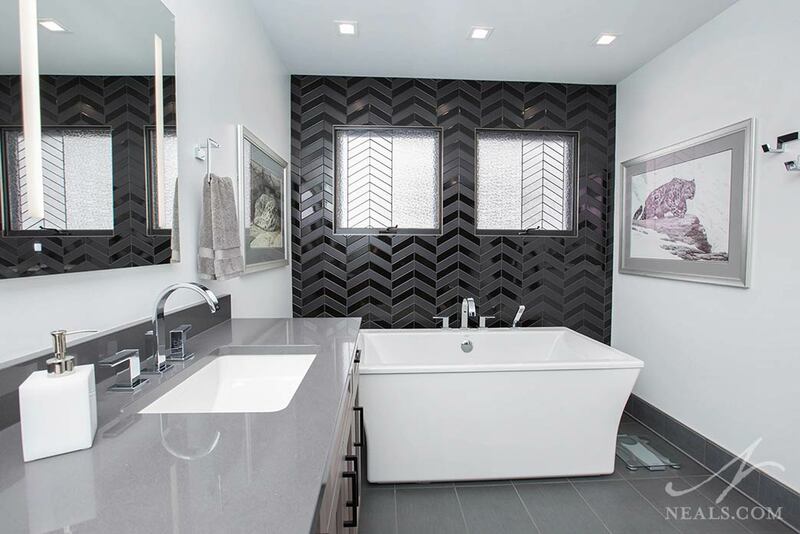 One thing this new bathroom achieves very well is showing how a stylish design can be created when you avoid being too matchy, and stick instead to looser color and pattern themes. Click here to see more photos from this Anderson Township project.